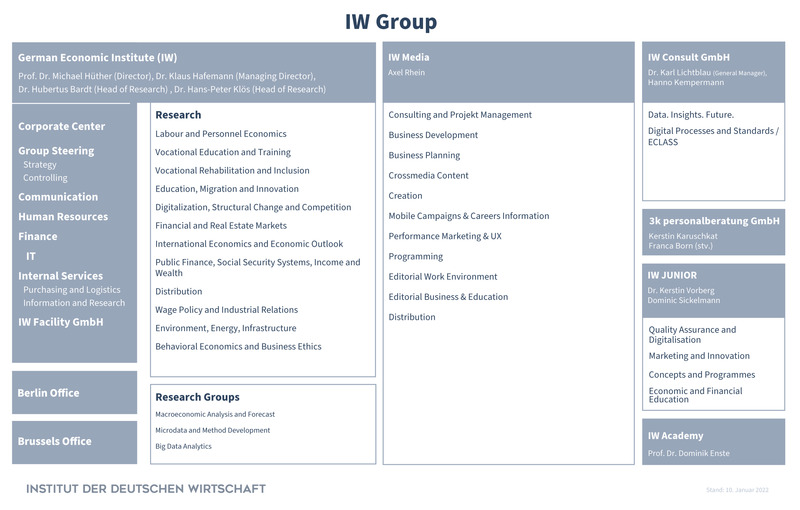 The German Economic Institute (IW) is a private economic research institute in Germany, which is a advocate of a liberal economic and social order. We work to improve understanding of how business and society function and interact. Information on the Institute’s upcoming events and documentations of past events. Members of the committees and research staff of the German Economic Institute. Eleven Research Units make up the Research Division of the German Economic Institute (IW). The IW maintains three Research Groups staffed by Scientists from various Research Units. The German Economic Institute's director and his team carry out research addressing today's pressing issues. Special programms, projects and initiatives run or supported by the German Economic Institute (IW). The German Economic Institute participates in a number of national and international networks. The German Economic Institute has four subsidiaries. In addition to its headquarters in Cologne, the IW maintains offices in important cities. The German Economic Institute (IW) and its subsidiaries offer an exciting and demanding working environment. Knowledge is the most valuable raw material for progress in our society, for economic growth and greater prosperity. Creating and imparting economic knowledge and thus prompting change: this is the task the German Economic Institute (IW) has set itself – with the clear objective of making our national economy fit for the future. We stand for free enterprise, competition and open markets. Our studies, projects and policy recommendations identify the risks and opportunities for our economy and our society. This makes the German Economic Institute a highly respected voice in public discourse and a much-consulted source of information and advice. Our research results and position papers are eagerly debated and used extensively by policymakers, business leaders, the scientific world and the media. We see ourselves as a service provider in economics and social science. From polls and statistical surveys of companies, business associations and the scientific world we obtain a constant stream of empirical information and new understanding of economic issues. The results of our work are published in printed and online media and thus made available to all those with an interest in our field. The strategies behind corporate investment, entrepreneurial activity and government policy need to be based on sound scientific research. Providing this is the central task of the economists and social scientists at the German Economic Institute (IW). Our world is rapidly changing. Globalisation, population growth, European integration, finance market regulation and digitalization are some of the more familiar examples of economic and social change. Highly qualified staff, innovative ways of working and lean organizational structures enable us to make sophisticated analyses of such issues and to keep abreast of change. The degree of cooperation and collaboration between our research teams is exemplary. We are convinced that only with interdisciplinary research and continually updated knowledge of markets, social structures and economic conditions it is possible to develop bold, forward-thinking and ultimately successful strategies. The advice and expertise of our economists are highly valued by ministries, government commissions and parliamentary committees at both federal and state levels. They hold teaching posts at universities and other institutions of higher education, author articles and studies for publication by the Institute and elsewhere and are in constant demand in the media for interviews and comment. The German Economic Institute (IW) is the private economic research institute in Germany. The Institute and its subsidiaries combine research, consultancy and communication services to provide convincing solutions. We believe in Germany’s socially responsible free market economy. We are advocates of a liberal economic and social order. We work to improve understanding of how business and society function and interact and by doing so contribute to sustainable growth and long-term prosperity. Our behaviour towards others – both inside and outside the Institute - is characterised by credibility, reliability and respect. We cultivate a culture of trust. Our attitude to criticism and mistakes is constructive. Our communication is direct, transparent and unambiguous. Our high performance culture offers both challenges and encouragement. We are highly skilled, motivated, open to change and take personal responsibility for our actions. The compatibility of family and working life, our professional and personal development and a healthy working environment are especially important for us. Our studies, projects and policy recommendations are methodically and empirically sound, socially relevant and state-of-the-art. Our consultancy and communication services are client-oriented, creative and customised to their target group. We combine our scientific expertise, consulting and media skills to create innovative one-stop solutions for our members and clients. Our work is addressed to policy-makers, the general public, business and the scientific community. The German Economic Institute is a registered association with a membership consisting of some 110 German business and employers' associations as well as a number of individual companies. Membership fees totalling approximately 12 million euros annually finance our regular scientific research and journalism. Additionally, collaborating particularly with other business associations, foundations and public institutions, we conduct research projects and carry out numerous studies financed by third parties. Through their representation on its governing bodies members affect the general policy of the institute without influencing the content of individual studies or statements. Our research is based on empirical principles and sound scientific methodology. It is independent of individual interests and represents free enterprise in German business for the benefit of society as a whole. The Institute and its members are united by an awareness that without its socially responsible free market economy our country would not have been able to achieve the prosperity for which it has so successfully striven over the last few decades. Looking to the future, it is equally important that we do nothing to restrict the economic strength of our country, our enterprises and our workforce, our small businesses and the self-employed, but do all in our power to enhance it. For only then can we achieve the level of innovation and economic success which is the basis of a better standard of living. We believe in the power of freedom and responsibility. And that is why we at the German Economic Institute strive – from conviction and with full commitment – to advance the spirit of free enterprise.